Essex Aviation’s primary goal is to provide you with the quality corporate aviation consulting services you need to make an informed decision. Our aviation consultants leverage the most current industry knowledge and our years of industry experience to help you evaluate the many options available to meet your private aviation transportation needs. A new aircraft is an important investment. Get the insight and expertise you need to confidently navigate the design, purchase, final delivery and acceptance of your new private aircraft with your partners at Essex Aviation. With so many options to consider and important decisions to make, it’s helpful to have an experienced private aviation consulting firm by your side. At Essex Aviation, we can help you confidently navigate your next pre-owned aircraft acquisition or refurbishment project. A new aircraft should meet your every need and incorporate designs made to fit your unique specifications. Essex Aviation’s Aircraft Completion Management service is designed to help you finish the completion process with confidence, so that you end up with an aircraft that best meets the needs of your family or business. If you’re new to private aviation or simply looking to make a change, Essex Aviation can help you confidently navigate the purchase or lease of a fractional share. Our private aviation consultants will guide you through the entire process — from evaluating all available options to final contracting — and we will be there for you if you decide to make a change or exit your fractional share. If you are a light traveler, looking for a private aviation option with low capital outlay and flexibility in aircraft type, membership or card programs may be the right choice for you. 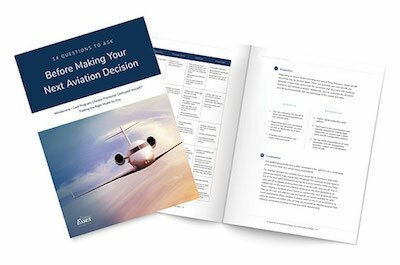 Essex Aviation consultants can help you evaluate options and make the right choice for your unique needs. Looking for scheduled transportation flexibility without the capital investment of acquiring a private aircraft? Charter may be a good option. The aviation consulting experts at Essex Aviation can evaluate your needs and present you with charter options to ensure that you end up with an aircraft and charter operator that can best meet the unique needs and requirements of your trip.